The Brisbane Broncos and the Sydney Roosters will make history on Sunday when they contest the first NRL Women’s grand final at Sydney’s ANZ Stadium. The Broncos won all three matches of their short competition and are undefeated, while the Roosters, who were in last place on the NRLW ladder and winless heading into the final round, beat St George Illawarra 26-6 in their round 3 clash to advance to the grand final on points for and against, ahead of the Dragons and New Zealand Warriors. Sunday’s inaugural match is being predicted as a tight tussle between the two pre-competition favourites, with the Broncos tipped to emerge victorious. 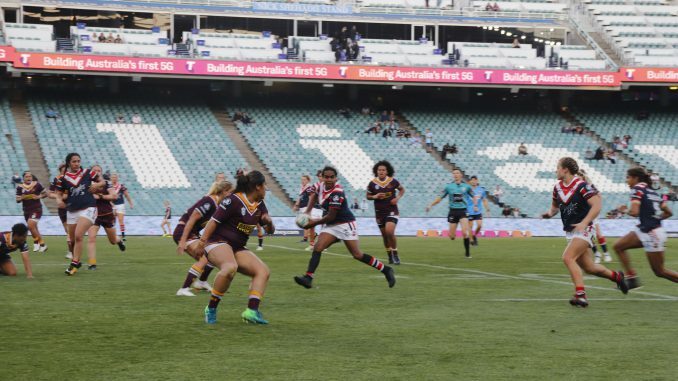 SBS news and sports reporter Laurie Lawira, who refereed women’s rugby league in the Sydney Metropolitan women’s competition a decade ago, and once ran the line as a touch judge for the Women’s Interstate Challenge in 2011, said the Broncos were likely to prevail. He noted their superior experience across the park, as well as the momentum gained in their undefeated run during the competition matches. “The Broncos have shown they’ve got … a little bit more experience in the winning department, I guess, to probably just get there, but [it will be] a close game nonetheless,” he said. Robert, a 24-year-old league fan who works for the NRL, tipped the Broncos to be 2018 NRLW Premiers and captain Ali Brigginshaw to win the Karyn Murphy medal. Angela Bacic, who writes for The Women’s Game website on on sports including rugby league, also predicted a Broncos win. She felt the Broncos would have too much firepower for the Roosters, who only hit form during their last competition match. “Looking at both teams and how they played their last game, I think if the Broncos can stop Taleena Simon on the wing, then I think they will win,” she said. “Obviously they [the Roosters] finally found their form against the Dragons, and finally figured you have to go direct [forward] rather than going out to the wing straight away. "The Broncos are far superior and they've got the strongest side of any team I've actually ever seen." Bacic rates them as highly as the men’s Broncos Premiership-winning team of 2006 in the skills department. She and the other commentators regard women’s rugby league played on the big stage as a win for women and especially young girls. Bacic, who initially played netball before representing Queensland in Futsal, a version of five-a-side football, now sees a much better and more diverse path for young girls, and says they can dare to dream. “I loved the Broncos, I loved going out to watch them, but when you grow up not knowing if there’s a women’s team, you pretty much feel like you’ve got to go and play the girl’s sports of netball and swimming because there’s nothing around. “There were no girls playing rugby league. “To see it now, for the NRL to have an NRLW competition, it’s pretty amazing not just for my generation, but for the young girls coming through,” she said.